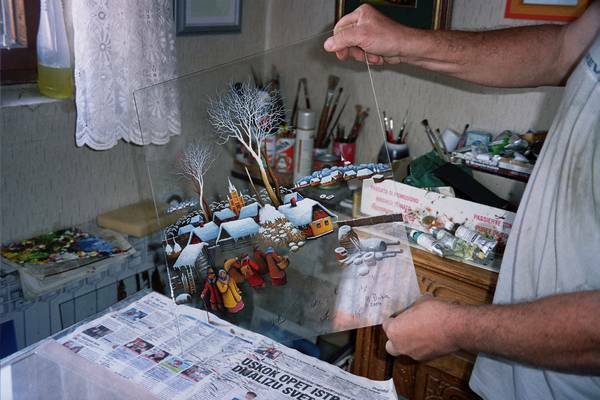 Croatian Naïve Art is known the world over for its intense colors, interesting subject matter and for the fact that it is painted on the back side of a normal pane of glass and viewed through the front! It is often produced by self taught farmer artists, although today there are others painting in a, perhaps, more sophisticated style. Originally this began as a form of “protest” art as the artists were painting scenes showing the repressive government under which they lived. The subject matter has evolved to include almost anything, yet often revolves around everyday life on the farm. Today these Croatian artists are recognized the world over as having taken this art form to its highest level. We are in the process of selling many paintings from our collection as we continually look for new ones to replace them. "We want to help bring some well-deserved recognition to a few of the world's greatest artists by offering our friends and customers unique paintings they will love." 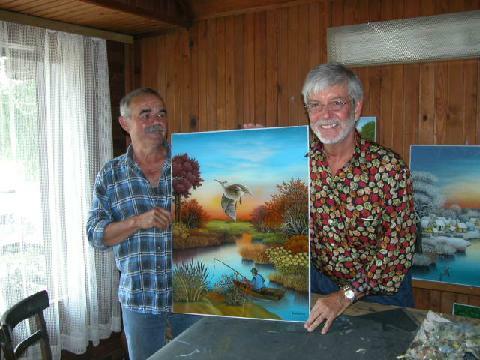 Naive art is generally accepted as artwork produced by self-taught artists or those who are not trained in classical academic methods. The work tends to be childlike, often with bold, unrefined colors, exaggerated detail and, frequently, distortions in perspective and proportion. The term is also sometimes applied to the works of trained artists who intentionally paint in this style. In their world, emotions and soul are more important than reason and intellect. The artists' sensibility is very peaceful and reminds us about the simple pleasures in life. I think these types of paintings would be perfect near our computers. It will be the best way to make us remember that technology takes too much away from our everyday life! The paintings are very intense and bright. Because they are painted on glass they have the most vivid colors you have ever seen. Remember, signature and foreground go first and then layers and layers of oil-- just the opposite of painting on canvas. Spectacular and powerful! 95% of these artists are over 60 years old, and not many of the younger generation are following in their footsteps. You will not find this art anywhere else in the world. These artists are universally recognized as having taken this art form to the highest level. Unless something happens to give this art form a resurgence in popularity, these artists will pass on and the best of this art will be left in the hands of collectors who seize the opportunity it represents today. My name is James A. Nannen and I have done many other things in my lifetime that I won’t get too involved with, but let’s simply say that my life has been full and most would call it successful. I have other businesses with which I am involved mostly on a consulting basis and don’t have to work if I don’t want to, but this “niche art from emerging nations” thing has me truly excited! You must know what it’s like, when you have something you really believe in, that you like to talk about it with others? That’s what I’m doing. I like this art so much and I know others will too if they simply take a little time to learn about it. Having personally visited many of the recent generations of Croatian Naïve artists where they live and work as well as being fortunate enough to have also met some of those whom I and others call The Masters, I have amassed enough paintings for my wife Donna and I to feel we have a really nice collection for both our enjoyment and investment. Now I want to concentrate on upgrading our collection by selling some paintings we have collected while at the same time purchasing new works for ourselves. It is not a big formal deal here. We simply have some of the nicest and most meaningful paintings you will ever set your eyes on with new paintings arriving all the time (I like to say they are continuously “trickling in”) from a niche that not many people know about today. This is good for you and this is good for me. We get in at the bottom of today’s market; a new market we are helping to create. 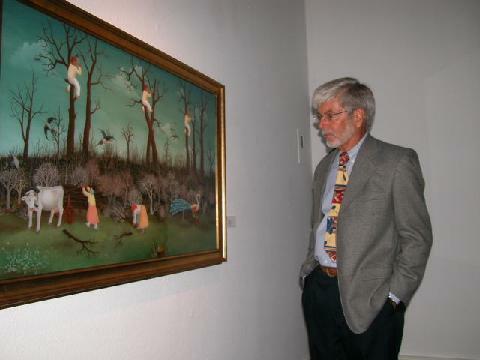 Enjoy looking at the paintings we have gathered here. Look at the information we have, but remember what everyone will ultimately tell you about art: buy it because you like it since you will be looking at it every day. I would rather see you purchase an inexpensive painting that you love and maybe would find impossible to sell (I don’t think I have any of those! 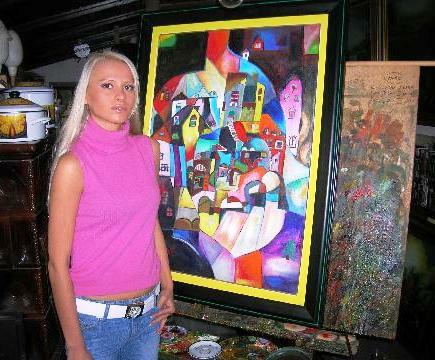 ), than have you purchase one of The Masters that you are actually not that fond of only for the investment potential. I hope you enjoy viewing the site. Email me with questions. I’ll try to respond promptly. Most of these artists come from the region of Podravina (famous for the small town of Hlebine where this art form got started) in the northern part of the country on the Drava River near the Hungarian border, about 50 miles from Zagreb, the capital of Croatia. To make a long story short, the artist Krsto Hegedusic found two young farmers in the late 1920s (Ivan Generalic and Franjo Mraz) painting in Hlebine. He taught them the technique of painting on the reverse side of glass. The reason for painting on glass was that the colors are much more vivid than anything you will ever see on canvas. The signature had to go on first. 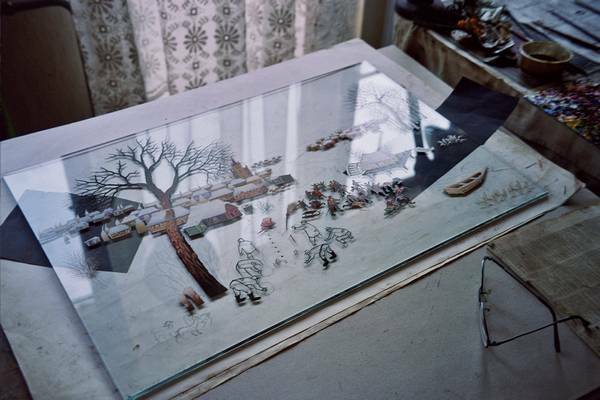 All of the main images and foreground needed to be placed on the glass next so that afterward there would be nothing covered up by the final touches of the painting. After each stage, the painting must be left to completely dry so a single painting could turn into a project that lasted from days to years. Well, there is a history of about 100 years of this form of art from this part of the world, but let’s just say that these artists from "The Hlebine School" started out painting what might be called "social protest" art because of the harsh injustices placed on the peasants from an overly repressive, dictatorial government. They painted anti-government scenes. For a period of about 7 years when it was forbidden to create this type of art, the artists were banned, and only the bravest of them continued to paint in what was an underground movement. Hegedusic thought that the only reason for the art should be to protest government actions, but many of the young artists decided that there were other things they would prefer to paint. Generalic, Mraz and others began to paint things they knew and lived: farm scenes, winter scenes and life in general in the countryside of Podravina. 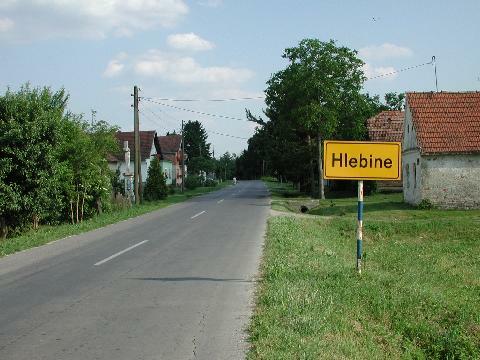 Eventually there came a split between Hegedisic and the Hlebine School painters, which had grown to include many more than simply Generalic and Mraz, and they basically parted ways. Not meaning to skip a lot of history, but for the sake of brevity, I will bring us up to the present. The Masters of the movement begin with "The Four Ivans": Ivan Generalic, Ivan Rabuzin, Ivan Vecenaj and Ivan Lackovic Croata as well as Mijo Kovacic, Mirko Virius, Franjo Filipovic, Franjo Klopotan, Dragan Gazi, Josip Generalic (Ivan's son) and a several others who have paintings in museums around the world. Today, there are more than 100 of these artists painting on glass! The subject matter and individual styles vary much more than they did in the infancy of this movement. I personally feel that the caliber of art in general has gotten better with the passing of time. The "technique" is being perfected. You can collect the newer generations of these artists (second- and third-generations) without spending a fortune. These are unique originals, not serigraphs, lithographs, giclee prints or photographs and from some of the most talented artists in the world! 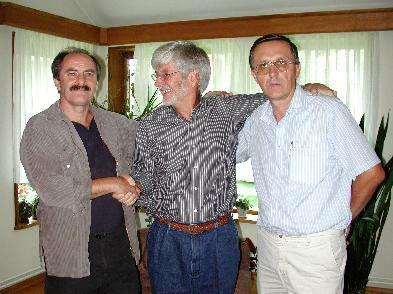 Let’s review those who are called the Masters of the movement, beginning with "The Four Ivans": Ivan Generalic, Ivan Rabuzin, Ivan Vecenaj and Ivan Lackovic Croata as well as Mijo Kovacic, Mirko Virius, Franjo Filipovic, Franjo Klopotan, Dragan Gazi, Josip Generalic (Ivan's son) and perhaps a few others have paintings that could certainly become museum pieces (and many are!) albeit they are considerably more expensive than the newer generations. More expensive, yes, but still affordable for many! That's what's great about this thing I call "niche art from emerging nations." They are still affordable!